As part of my spiritual reflections for Advent this year, I am looking at an appropriate hymn for Advent each morning. This morning [9 December 2014], I have chosen the Christingle hymn, ‘Round orange, round orange, you serve as a sign’ (No 178). This is one of two Christingle hymns the Church of Ireland includes in the Church Hymnal: ‘It’s rounded like an orange’ (No 165) and ‘Round orange, round orange, you serve as a sign’ (No 178). Although they are Advent hymns, they are included among the Christmas hymns in the hymnal with an Incarnation theme. During my two recent lectures on Advent Spirituality, I spoke of the Christingle service as a valuable resource for parishes and churches. A Christingle is an orange surmounted by a lighted candle and decorated with fruit and a red ribbon. This is a Moravian tradition that was introduced to Anglicans in recent years. It was developed by the (Church of England) Children’s Society, and has become increasingly popular in the Church of Ireland. This hymn in 1989 was written by Elizabeth Consett, a hymn-writer and teacher in Saint Catherine’s College, Liverpool, in response to a request from the Rector of Liverpool, Canon Nicholas Frayling, then Precentor of Liverpool Cathedral, for a suitable hymn to be sung at a Christingle service. The hymn was first sung later that year at a special service in Coventry Cathedral to mark the 21st annual Christingle service of the (Church of England’s) Children’s Society. I got to know Nicholas Frayling when he was resident in the Church of Ireland Theological College (now the Church of Ireland Theological Institute) while he was working on his highly-acclaimed book, Pardon and Peace (1996), which was launched in Christ Church Cathedral, Dublin. He retired earlier this year as Dean of Chichester. Please note that Stainer and Bell Ltd are the copyright owners of this hymn, and no commercial use whatsoever may be made of the text without prior permission from Stainer and Bell or the administrators/owners of the copyright. The verses of this hymn follow the process of creating a Christingle, using an orange and the other symbolic decorations. 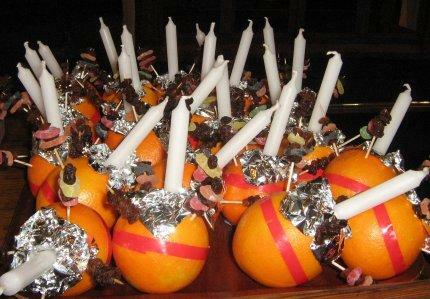 As the Christingle is created, verses 1 to 4 may be sung one at a time, preceding or following each stage of the activity. Then the whole hymn (verses1 to 5) can be sung at the end. The hymn is rich with symbolism that coincides with the symbols used in the hymn. The orange represents the world. The red ribbon indicates the love and blood of Christ. The dried fruits and sweets are symbols of God’s creations. The lit candle symbolises Christ, the light of the world. That God made the round world with purpose divine. Be glad, give thanks, rejoice in God’s name. Red ribbon, you tell of the bloodshed and pain. Which led to forgiveness when Jesus was slain. When God hands out presents they’re meant for us all. The true light from God found a home with us here. Christingle, Christingle, shine out in the night.